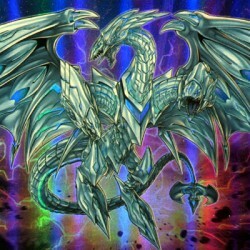 "Blue-Eyes White Dragon" + "Blue-Eyes White Dragon" + "Blue-Eyes White Dragon". At the end of the Damage Step, if this is the only face-up card you control, and this Fusion Summoned card attacked: You.. If you control no monsters, you can Special Summon this card (from your hand). If this card destroys an opponent's monster by battle: This card gains 500 ATK. If this card is destroyed by battle: The ..
You can Ritual Summon this card with "Chaos Form". Must be Ritual Summoned, and cannot be Special Summoned by other ways. Cannot be targeted, or destroyed by, your opponent's card effects. If this car.. When a face-up "Blue-Eyes" monster(s) you control is destroyed by battle or an opponent's card effect, and you have a Dragon-Type monster in your Graveyard: You can Special Summon this card from your ..
Once per turn: You can pay LP in multiples of 100; other face-up monsters on the field lose that much ATK. Once per turn: You can target 1 monster on the field with ATK less than or equal to this card..
Target 1 Dragon-Type monster you control that was Special Summoned this turn; for each monster your opponent currently controls that was Special Summoned this turn, it gains 1 additional attack during.. This card can be used to Ritual Summon any "Chaos" or "Black Luster Soldier" Ritual Monster. You must also Tribute monsters from your hand or field, and/or banish "Blue-Eyes White Dragon" or "Dark Mag.. When a card(s) you control is destroyed by a Spell effect (except during the Damage Step): Target 1 card your opponent controls; destroy it. During either player's turn, except the turn this card was .. When an opponent's monster declares a direct attack: Negate the attack, and if you do, draw 1 card, then if it is a monster, immediately after this effect resolves, you can Normal Summon it in face-up.. When an opponent's monster declares a direct attack, if its ATK is greater than or equal to your LP: Special Summon this card in Attack Position as an Effect Monster (Warrior-Type/LIGHT/Level 4/ATK ?/.. If all monsters you control are Rock-Type monsters (min. 1) while this card is in your Graveyard: You can Special Summon this card. You can only use this effect of "Sentry Soldier of Stone" once per t.. If this card is destroyed by battle or card effect: You can Special Summon up to 2 other "Marshmacaron" from your hand, Deck, and/or Graveyard. You can only use this effect of "Marshmacaron" once per .. If this card is Normal Summoned: You can add 1 "Magician Girl" monster from your Deck to your hand. Once per turn, during either player's turn, when your opponent activates a card or effect that targe..
Once per turn, if this card is targeted for an attack: You can Special Summon 1 Level 5 or lower Spellcaster-Type monster from your hand, then change the attack target to it, and if you do, the attack..
During either player's turn: You can discard this card; "Magician Girl" monsters you currently control gain 300 ATK and DEF for each "Magician Girl" monster with different names on the field and in th.. When this card is Normal or Special Summoned: You can Special Summon 1 Level 4 Machine-Type monster from your hand. If this card is destroyed by battle or card effect: You can Special Summon 1 Level 4..
Activate this card by banishing 2 monsters you control, then target 1 face-up monster your opponent controls; Special Summon this card in Attack Position as an Effect Monster (Spellcaster-Type/DARK/Le..
Activate this card by targeting 1 face-up Attack Position monster you control. Once per battle, during the Battle Step, if it is attacked by an opponent's monster with higher ATK: You can inflict dama..
Activate this card by targeting 1 face-up Attack Position monster your opponent controls. At the end of the Damage Step, when it attacks a monster, but the attack target was not destroyed by the battl..
Activate this card by targeting 1 Level 4 or higher monster you control; Special Summon this card as an Effect Monster (Rock-Type/EARTH/Level 4/ATK 1000/DEF 1000), then equip that face-up monster to t.. While you control a Spellcaster-Type monster, any damage you take is halved. (You cannot halve the same damage twice this way.) If this card is sent from the field to the Graveyard: You can target 1 S..